#1. I feel there are plenty of reviews out there for the spec person to read, but not as many for folks that simply want a candid opinion of how a bike handles and rides. #2. I've never done a review on one of my bikes before. My biggest beef is every review I read is so darn "tech-y" and lacks simple candid speak about how their experience was on the bike. It's my blog, I'm not getting paid to write about the bikes, so I figure I can write the review however I want. Ha! 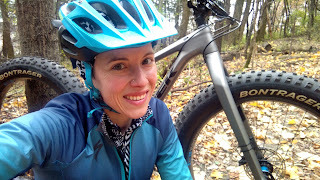 This is the first review on this bike as I plan to write a second review after I've ridden this bike during the snow season. 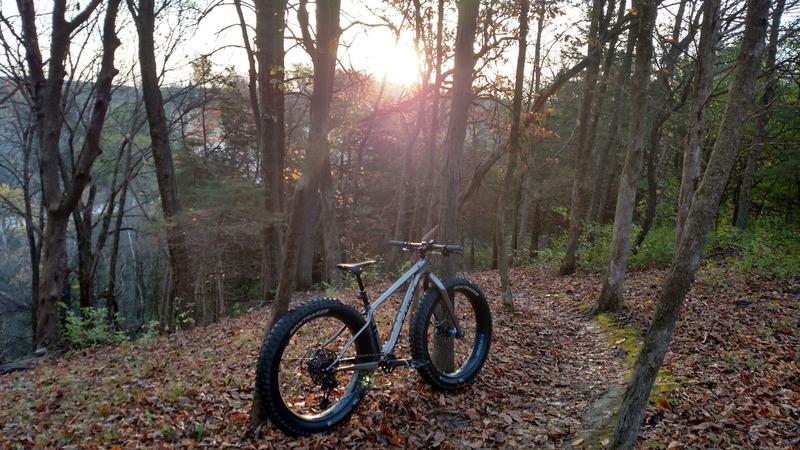 Last winter Travis got his hands on a Trek Farley 9.8 and absolutely loved it. He thought it was fabulous and the most fun he's had on a fatbike in a long, long time. I watched him climb up packed trails without issue as I would spin out. I might say a little bike envy happened! My lack of success was more likely due to my tire choice, but I hated the idea of switching tires on a regular basis. Unlike Travis' bike, mine would come with the SRAM Eagle drivetrain (1x12) and a dropper post, two things that I've been itching to try and would finally have the opportunity to do so. I'm an avid 1x rider and have really enjoyed the 1x11 setup. Would I need 1x12? I don't know. Would I truly need a dropper post? Probably not, but it's something that many folks get to try out on our rentals...it's high time I learn more about it, experience it, and figure it out. We kept this bike stock minus swapping out the saddle for my women's specific Ajna saddle and changing the stock tires out to put on 4.5" Gnarwhals. The intent was for this to be my winter steed for snow-riding and we'd leave studded tires on my Fatboy for icy conditions. Even with the knobs on, I wanted to test out the bike on dry trails vs. getting my handling experience only in the snow. So, we took Davey Jones (the Farley) out to Palisades for a short jaunt. I will admit, I wasn't 100% in total love with the bike. #4. I never dialed in air pressure prior to going out, thus I had a typical "Josie was in a hurry and is going to fumble around" experience. The other day I decided it was time to take Davey Jones out again because temperatures were going to be dropping and I was going to have to tuck the squishy bikes in for the winter season. I might as well get more used to riding without suspension now vs. later. Not being fair and riding the Fatboy back-to-back with the Farley I have to say I really liked the geometry of the Farley. The 27.5" wheel size compared to the 26" wheels made me feel more at home, somehow. I know some of this is your tire choice on the 26" fatbikes, and having the more minimal Vanhelgas on vs. a wider tire would change the overall height/feel of the bike. I've felt like I'm "low" when I'm on the Fatboy when compared to how I feel on the Farley I was tickled because it felt like I was on one of my other bikes in terms of standover and how I rolled. It might just all be in my head. Either way, it felt more off-road capable and mountain bike-ish, and I really enjoyed that. I felt the handling of the bike (after a couple instances of not being graceful) was great. It felt like it could turn well and seemed very responsive. I even used this bike to session a particularly tight uphill corner which surprised Travis because there was literally no room for error, and I was successful! Since there was virtually no wiggle room, I learned to maneuver the corner pretty quickly. Rigid isn't something I love, and I could feel it in my shoulders/arm/neck. However, it was a good way to practice keeping my body "loose" instead of riding ridged myself. There was one point tho where I was almost completely bounced off my bike- yes, being clipped in would've helped, but one instance of "Doh!" isn't going to make me convert. Lesson learned! I should've weighted my pedals more and/or been more aware of what I was riding. 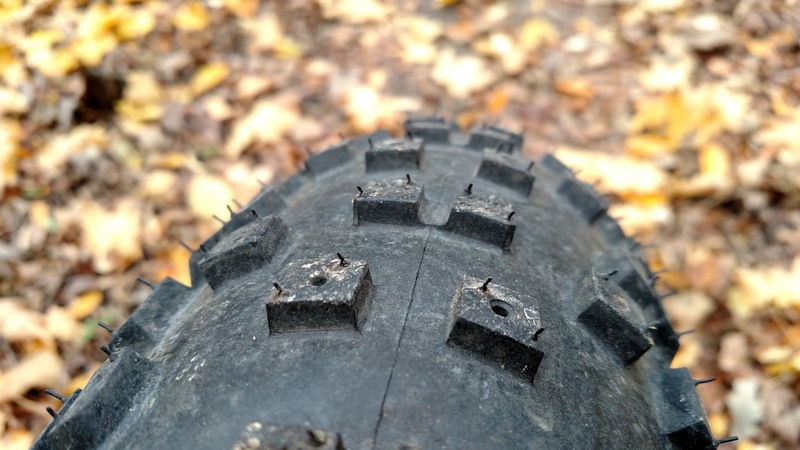 The Gnarwhal tires are AMAZING, granted, more tread than what is needed for our leafy trails- but gosh darn they have so much traction! The bike literally ate uphills and experiencing that phenomenal traction put a smile on my face, probably more than just bombing over obstacles. I am more of a climber than a descender I think, and I can appreciate a bike that helps me get up hills. Our trails in Decorah have been leafy, so I curbed my speed as I am more of a cautious rider. I wiped out pretty hard, twice, on my Spearfish during a group ride due to leaves. So my trust of cornering/speed/leaves just isn't there- I did feel confident while descending, and that was helpful! I focused most of my ride on climb-intensive trails to give myself a workout, but to also see how "difficult" riding a fatbike would be as I was so used to not riding big tires. It really wasn't bad! 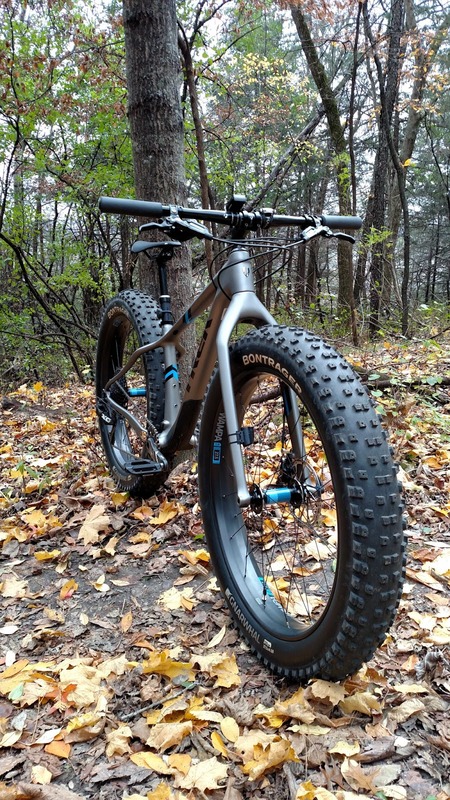 Folks will ask all the time how "hard" fatbikes are to ride, and they aren't. It's like riding any other bike- you pedal and it moves forward. Depending on the bike and how it's built, you might have a 40 lb tank or you may have something sub 30 lbs. It's up to you and how much you want to spend for what type of ride. 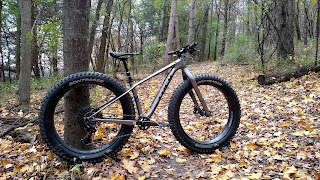 For many folks, once they try a fatbike, get why they are so damn FUN! Take me, for instance. I've become somewhat obsessed with how fast I can go on trails; putting me on a fatbike decreases my ability to go as "fast" but it increases my ability to just enjoy riding my bike. You can bomb over things (roots/rocks) with ease. You can climb hills with phenomenal traction. You can hear the fun "vroom-vroom" sound the tires make when you're going down a hill or riding on pavement. (It's hard to actually write out the sound, it's best you take a fatbike out to experience it first hand!) 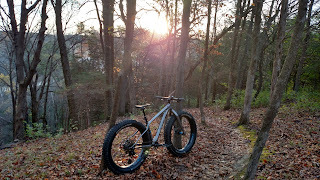 Short summary: a fatbike makes riding happy. The dropper post is something that may take me a bit to get used to. I learned to ride our trails with a seatpost up, so having the ability to not have it in my way is different. Sometimes I find myself feeling like it's easier for me to know if I'm back far enough with the seatpost in my way- I use it as a gauge. With it down, I'm a bit perplexed yet successful as I go down some of the more steep sections. "Am I back far enough? If I'm not, I'll find out the hard way..." I felt like it was less of an issue when I went down the Fred trail a second time. Obviously, the more I use it the more I'll get used to it. 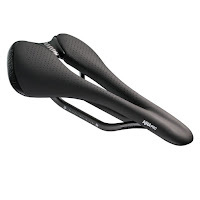 Mostly I'm hoping it will make my remounts in the winter less awkward and clumsy! My third ride on this bike had me feeling like I had a better groove- I could tell I was trusting the handling more. I'm still impressed with how the bike rolls and how even with 4.5" tires I feel like they are "small" and they don't make me think I'm going to fall off the trail because there isn't enough trail. (Oh, depth perception.) That might change in the winter when I'm riding what will seem like a smaller path. 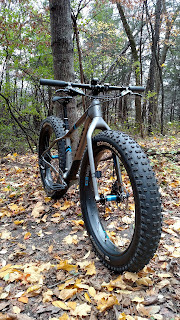 For me, the Farley feels more like a mountain bike than a "snow bike" and I really enjoy that. I'm intrigued by the possibility of turning it into a 29+ for dry-season riding, but we'll take baby steps with that as I'll have two other bikes to test out next season that I'm super stoked about. I started out riding trails on a 29+ so it would be fun to go back to my roots and see what I think several years later. 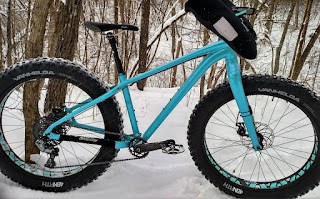 Also note: For folks not looking to buy a second wheelset and turn their fatbike into a "two-bikes-in-one" you can go the route of adding a front suspension fork! That will allow you to run higher air pressures in the front tire and take away some of the bumpiness during dry season riding. Folks who may have neck/shoulder/hand issues may find that to be a good route to go. It will also allow you to pedal more efficiently instead of working against lower pressure tires, thus, making it feel more like a big-tired mountain bike vs. "a fatbike." they are totally worth having around. It'll make riding in snow doable. 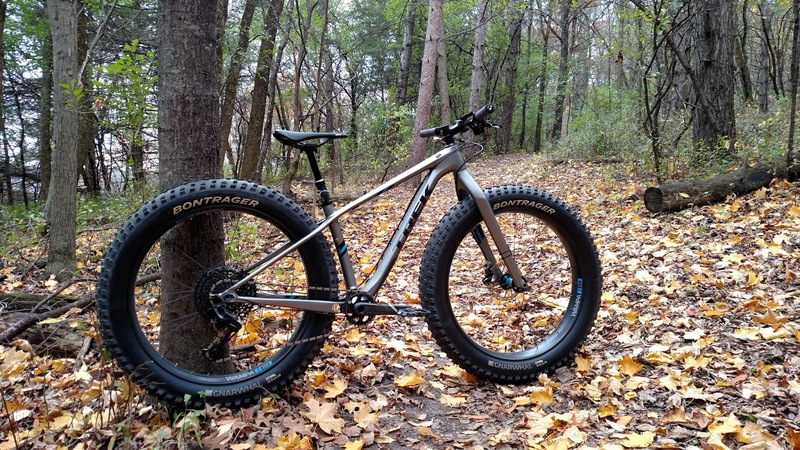 The Farley 9.8 is (unfortunately) sold out for the season, but you might have the option of getting your hands on one of the other Trek Farley options. So far, without any snow riding experience on this bike, I give it two (huge) thumbs up! I plan to write another review after I've experienced the snow season on this bike. All in all- give one of the new Farleys a try if you can, I left the trails with a big smile on my face, and I bet you will, too!